Seriously impressive. You've brought so much color, and life to that yard! And the gravel is a nice easy transition from the old (existing) hardscaping and the softer new landscaping. I had no idea that those curved borders inside the patio were actually steps! And seeing how the plants rise up in the beds next to the patio makes everything seem so nesty and come-on-in-and-relax-y. LOVE. Fantastical! I had an old row house in NJ (my first home), and I miss it very much. You're a lucky girl! and is that mr. man sneaking in a few winks before the next project?? you are blowing my mind so much that i can't even figure out how the different parts of the house and yard correspond to each other. was top darker part of the house sort of roof-ish? is that where the porch is? 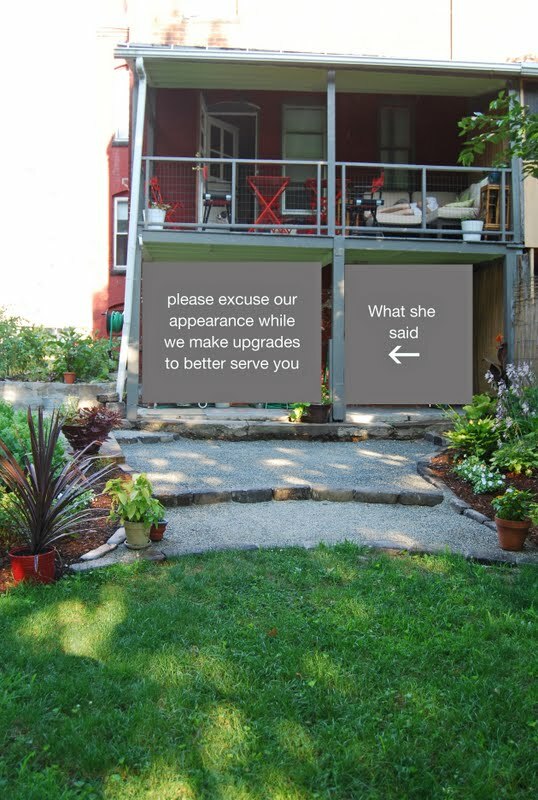 did you build your own porch, or did you just do some kind of magical transformation that i can't even understand? is the door and two windows to the upstairs porch where the two windows used to be, or where the one single tall window at the top was? i am feeling like a real dumbass! Hey, I think I hear Better Homes and Garden magazine calling...just beautiful! What a ton of work you guys have done. Fabulous! I'm also confused about where the upper door came from. Dearest Dearest Love And A Leash! We demolished the structure that enclosed our lovely back porches to expose everything you see in the second photo. 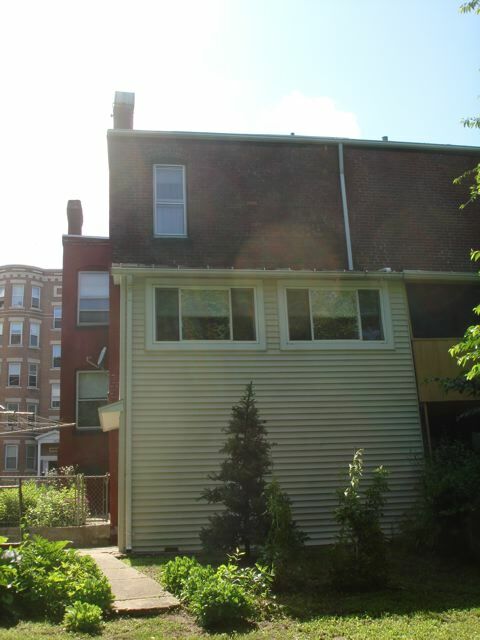 Both porches were enclosed in the first photo, but ugly siding and weird windows. That's why you can't see the windows or doors in the first photo. That was the first step in the process. Sorry I didn't include a 'during' photo! Awesome! Way to increase your outdoor living space! Do you ever go back inside? I'd hang out there all day, lounge and enjoy the beautiful landscaping you did! Gorgeous! WOW! That looks amazing! That angle totally changes the perspective and makes it easier to visualize! You guys did a wonderful job! WOW. That is just incredible. I'm glad you showed us the B&A from this angle!! This is a great example of having vision. Most people would've looked at that space as unusable, but opening it up has added so much light and extra living space. Nicely Done! Also, I'm loving your landscaping. Wanna come to my place and give me some ideas??? Maaaahvelous! I am inspired by your hardscape!